THE DANCER'S NECK PAIN, The Dance Thinker, Issue #3. 1. Check out the last page uploaded: Isadora Duncan. - A contemporary dance blog that will automatically distribute what you post to facebook, twitter and all subscribers to the site’s RSS feed. - A contact form through which you can address to me directly if you have questions, ideas, wishes, suggestions or commentaries. 1. Good news for modern dance lovers. Here’s the last page uploaded: Isadora Duncan. Summary about her artistic work and life. Includes images, videos and related links..
1. Resting (physically and psychologically). 3. Strengthening of core muscles. 4. Correct placement of breathing. 5. Complements to the therapy. Have you ever heard about the dancer's neck pain? Have you ever experienced it or do you have colleagues or friends that deal with it? If you belong to the dancing profession, you will very probably answer yes to one of these questions. Neck pain is a common affliction among dancers. It can go from a bearable, but sometimes constant feeling of discomfort, to states of painful stiffness that prevent us from working. As a dancer, I’ve gone through this experience. That’s why I’ve chosen to write about the topic; because I have a story to tell and share. I believe that having to deal with that situation has taught me as much about my body and practice as my dance teachers. So, I hope that my appreciations about this problematic, from the dancer’s perspective, might be of use for those of you having a similar situation or interested in the subject. I’m aware of the fact that a neck pain can be caused by too many different reasons, such as injuries or diseases. In the case of dancers, it can often be caused simply by improper placement, coordination or training, which is the dancer’s responsibility to understand. 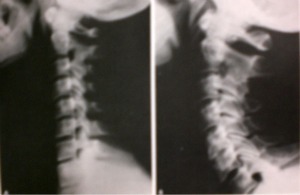 I had a neck pain crisis at the age of 22. At the moment I was so passionate about dance, that I would have trained 24 hours a day, non stop, if my energy would have allowed it (I’m still so fervent but go wiser now…!). Not only was I passionate, but also anxious about improving my skills and being a better performer. It seems like this behavior is a common characteristic among many dancers. We are worldwide recognized for the passion to our occupation and there’s also a kind of popular archetype that describes us as perfectionists and compulsive (just have a glimpse at the film “Black Swan” where Natalie Porter plays the role of a dancer, and you’ll find the popular archetype I’m talking about). Well, this feature of personality helps a lot to deal with the discipline and severity of our job, but when talking about our health it can be highly counterproductive. One of the things I had to understand, and accept, during my personal recovery process, was that resting is a fundamental part of training. Without the appropriate resting dedication, physical skills worsen, rather than enhancing, no matter how much effort we put on training. And when we push further from our biomechanical limits, we’ll very probably enter the domain of injuries or dysfunctions. It was very important for me to understand that resting doesn’t mean only to stop classes and sleep. Actually, a dancer’s rest also means to cross-train with practices that emphasize in recovering movement qualities (everything that goes towards relaxation or efficient coordination of tension). In my case, the study of Tai Chi Chuan, Hatha Yoga and the Bartenieff fundamental exercises was the key. Nowadays there are many methods to search for this and I guess each dancer has to find the one that fits her/him the best. Though, I believe it is important to understand that the value of cross-training with alternative methods does not only lie in the learning of other ways to move, but also in the different states of mind that those practices presuppose. Resting for a dancer also means to relax psychologically. It sounds so obvious, but in our competitive field it might not be it. So, just as the choreographer in the film “Black Swan” tells the prima ballerina: “Perfection is also about letting go”…, maybe our tired, overloaded neck might be released by our mind allowing that to happen. This condition can be prevented if treated early. The idea is to counter act the effects of class and training. First one must understand that the vertebral segments lock and become less mobile as a protective mechanism. Mobilization in the correct direction is a must. This is the initial phase of chiropractic care. 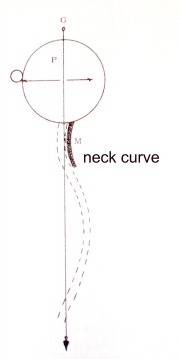 The tight longus coli muscles must then be stretched so that the compressive tension is reduced. We accomplish the stretching using massage, stretching routines, cervical traction and the use of a special pillow to support the neck during sleep. Photo taken from the book "The shoulder and neck". Bateman, J., W.B. Saunders Company, 1972. Now please believe me. Nor the massage by another person, neither the physiotherapeutic stretching routines or the cervical traction were effective for me. Doctors can guide us and they’re absolutely necessary to show us what we must avoid. But when it comes to the recovery process, they are not always helpful (other than usually extremely expensive), unless they dedicate daily, probably for years, to follow your case and adequate treatment to your needs (which is very unlikely to happen). Therefore, it is crucial that the dancer assumes the responsibility of her/his recovery, and this is not only by assisting to physiotherapeutic sessions, but also by accepting to study her/his body deeply and the possibilities to achieve its health. An important recommendation to begin such a process is the proprioceptive training. This means that we need to learn to feel and discriminate the movement of our muscles, in order to progressively know how to discharge or efficiently coordinate them, based on our own sensitive perceptions (without the need of the physiotherapist routines). As dancers, it becomes a responsibility to try to know, work, and maintain our selves healthy (or at least try), if we intend to have a long life as performers. In my case, I also discovered that I didn’t have enough coordination and abdominal force to correctly isolate the upper body from the lower body. This made me transfer a lot of the effort, when lifting or moving my legs, to the cervical spine zone. The result was the overloading of tension in that area. I later understood that this had to be eliminated by strengthening the core muscles, in charge of the legs, and by relearning the coordination to achieve isolation between lower and upper body. The practice of Hatha Yoga and Tai Chi Chuan taught me (among many other great things) about the different levels of breathing. With the practice and time I realized that I had the reflex of breathing with the chest (high breathing), which would again place additional tension towards the neck. I had to reeducate myself too, and spent hours and hours breathing consciously to change my high breathing habit into low or medium level breathing (which is with the belly or with the diaphragm). Low breathing released my neck enormously and also proved to give me a greater stamina. Those were my main needs, but talking to dancers suffering from neck pain makes me know that every dancer will have her/his specific needs. I was told to complement my process with therapy to reduce inflammation (using anti-inflammatory drugs or alternating heat and cold), and stress reduction strategies, including psychological counseling. The anti-inflammatory medicines meant real help to me. They were a great release and when asking the doctors about their use I got to understand about the closed cycle between muscular tension and pain. Excess of tension in a muscle causes pain, and pain activates the contraction of the muscle as a reaction, maintaining or increasing the tension. This creates the cycle that ends in spasms. The role of anti-inflammatory drugs or pain killers is to break this circle so that muscles can relax. Though, as good as they can sometimes be, remember that they’re not completely harmless. Use of non-steroidal anti-inflammatory drugs (NSAID) may reduce inflammation and pain associated with a particular inflammation, but dancing while taking NSAID can mask pain, which can lead to further tissue injury. So be careful of relying on that easy help. Only if you’re lucky, your neck pain will have a unique cause. The most common case is that it’s a combination of several different factors that lead you to the situation. Photo taken from the book "Cuello y brazo". Cailliet, R. El M.M., 1970. It’s been more than ten years now since I thought I would have to leave dance because of a cervical spine injury (so terrible was my neck pain). I’m still an active dancer and practice a basic yoga routine daily, which keeps my neck relaxed and painless. Maybe I had this experience because my dance education process was not the ideal. I only started a highly demanding training towards the age of 20. But I know that this is the case of many contemporary dance professionals, so this could easily happen to others. I believe it is too risky to talk about health and cure not being a doctor. Please remember that I’m sharing this story from my dancer perspective and that I don’t intend to provide or replace any medical treatment by writing this. One of the things that all this made me understand is the complexity of what we call ‘illnesses’. So please, make it your responsibility to get a correct diagnosis if you’re suffering from neck pain. I just hope my story can help you understand, accept or evolve within your own path.